The astrological or natal chart is a method of mapping the space surrounding our Earth for a birth moment. A natal chart (or horoscope) is simply a snapshot of the cosmos at the time of birth -- a cosmic portrait. We know that all things are in motion. Not only do the planets move slowly at different speeds in great elongated orbits around the Sun, but the Earth itself turns on its axis once in 24 hours. As the Earth turns during a day, each one of us is exposed to the entire 360 degrees of the zodiac. The natal chart is a diagram or picture that stops the cosmic clock and captures the universe as it exists at a particular moment. For one, the sign of the Sun was in on the day of your birth (for example Aries, Taurus, or Gemini) is only one of many factors that are looked at by professionals. In addition to the day and year of birth, most professionals use the time and place of birth as well. Birthdate, year, time and place are all needed to pinpoint your place in time and space. 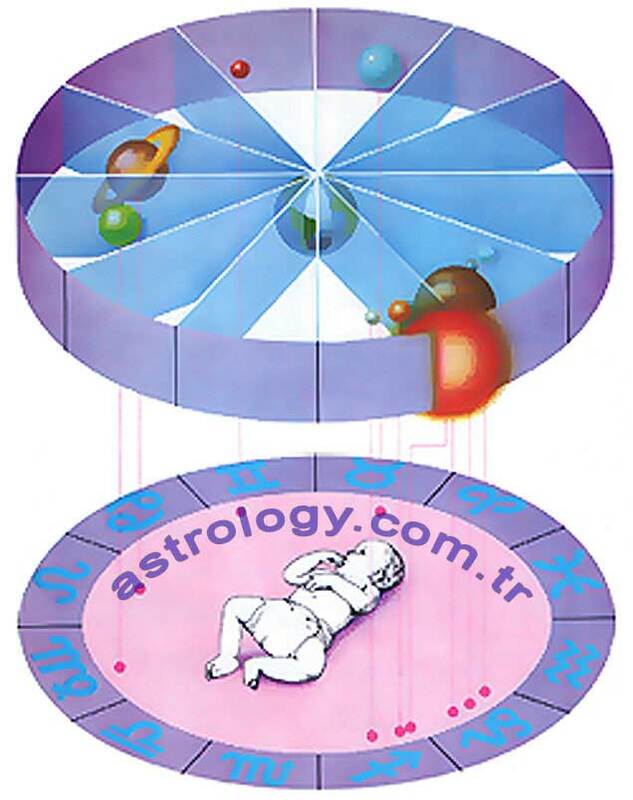 Given this information, an astrologer creates what is called a natal or birth chart. The very top of the chart or MC (Medium Coeli -- short for Midheaven) is that part of the zodiac directly overhead, while the bottom of the chart or IC (Imum Coeli, or lower heaven) is the part beneath your feet and on the other side of the Earth from you. At the extreme left-hand side of the wheel is the ascendant, or rising sign -- the part of the zodiac that is on the horizon or rising at the birth moment. Conversely, the descendant is on the right-hand side of the chart. This is the part of the zodiac that is setting. These four points, the ascendant ( ), descendant ( ), Midheaven ( ), and imum coeli ( ) are very important to astrologers. They are sensitive points. You can get your free birth horoscope from our Astrology Services.